Do you remember the Alfred Hitchcock movie “The Bird’s”? Well, that’s NOT what I’m talking about here! 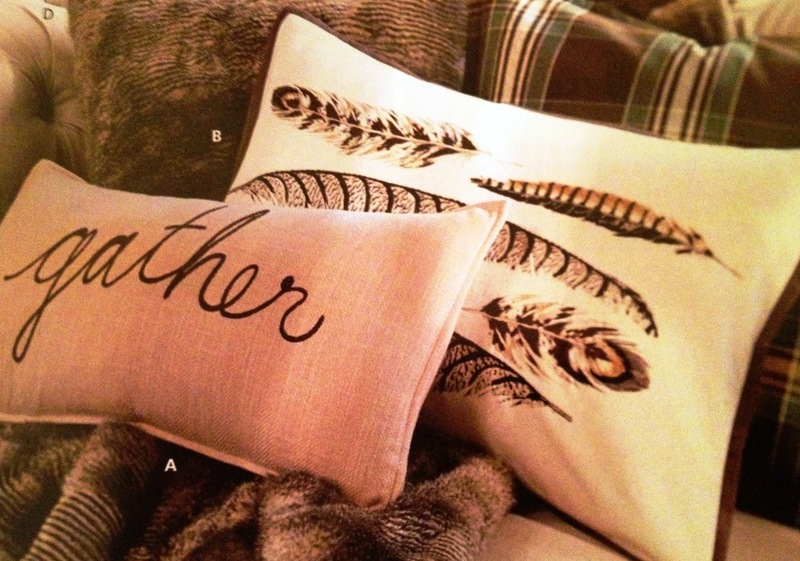 This season, why not bring fall birds into your décor. I mention this because they are everywhere, in nearly every home décor product, and in so many different species, you can choose your favorite! 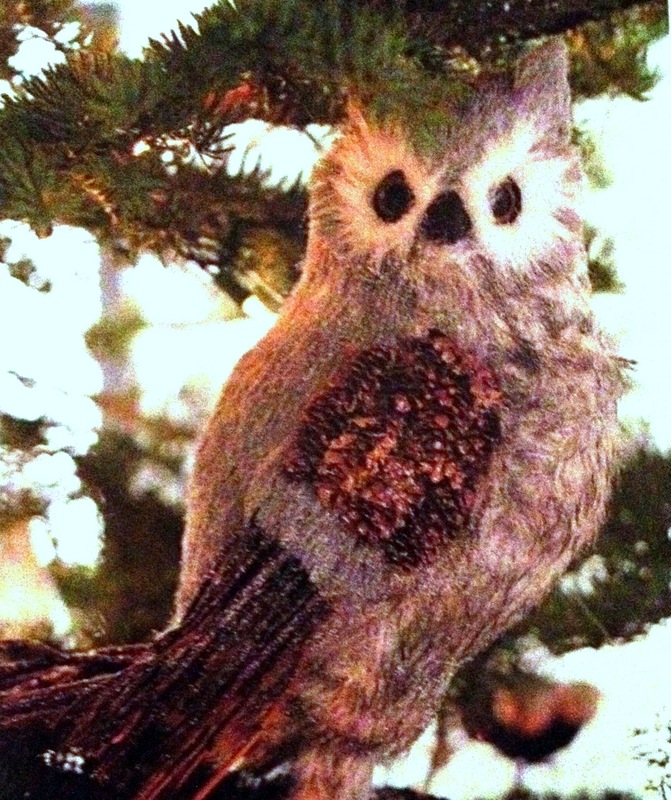 Owls have been a fall bird that has been around for a couple of years now, but they cover the range from elegant – to cutesy and crafty as in these stuffed versions. They are made out of printed cotton fabrics, felt and buttons. Fun to make and easy to display then store until next year. 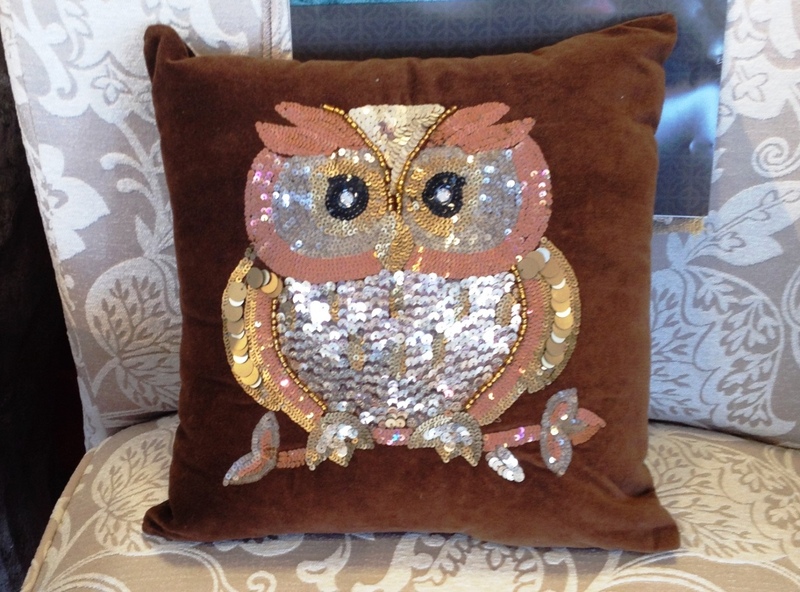 Now here’s the elegant owl all decked out in the finest sequins and glitter! 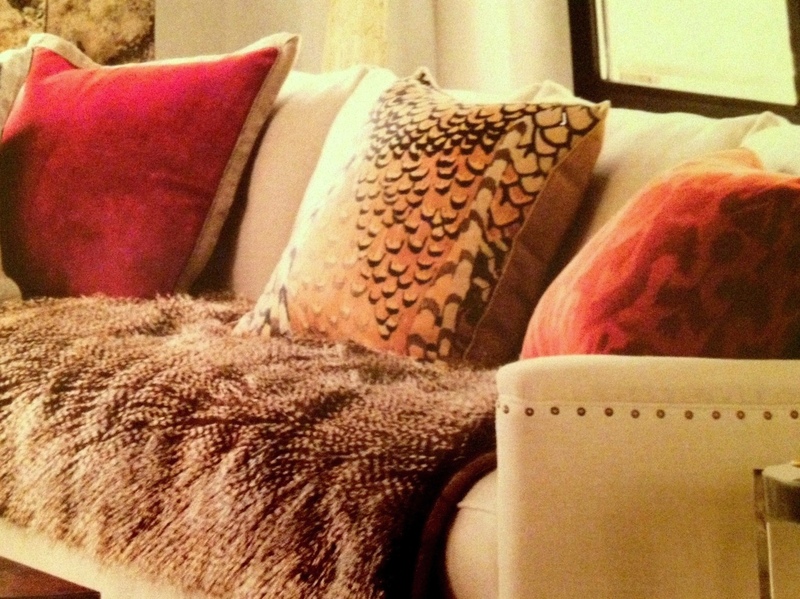 I can see this fall bird motif fitting in with an upscale, sleek décor and always being out on display. Just don’t lean against it or sit on it, and it’s certainly not appropriate for afternoon napping! 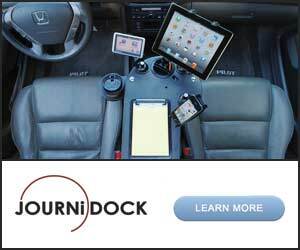 Look, don’t touch! I’ve now seen owls in two different Christmas tree displays with a lot of additional natural elements. They do create a lovely neutral tree all in tones and tints of brown and cream. Other ornaments include pinecones, feather balls, thistles and berries. 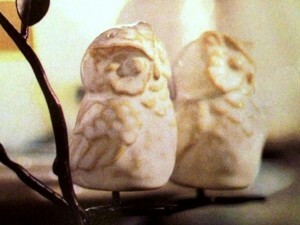 Owl salt and pepper shakers anyone? 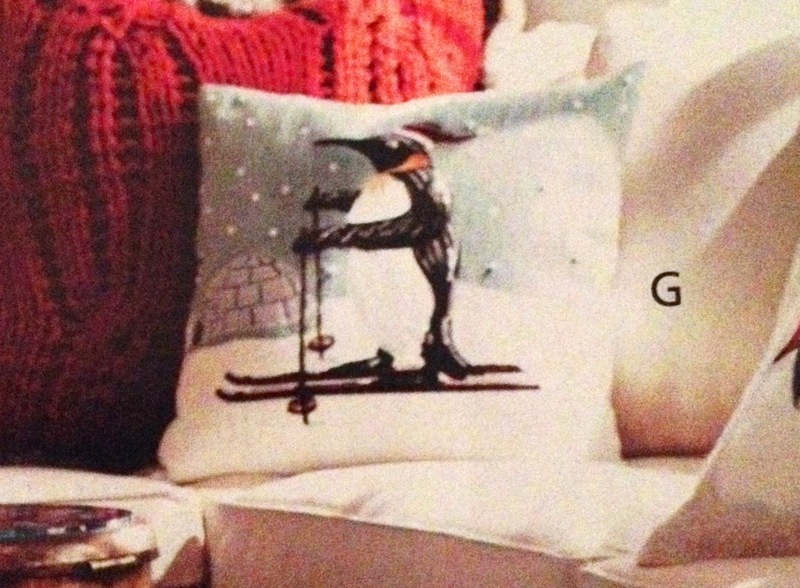 You can find them at Pottery Barn in their October 2014 catalog! what is extra cool about these is that these fall birds are attached to an iron tree branch instead of simply sitting on your table. In essence, they are art for your table! Fall is the time of year for turkeys, so I’m not going to make too much of this because I doubt if anyone is going to decorate around a turkey theme, but I did think this sequined turkey, like the sequined owl was really dressed to the hilt for the season! 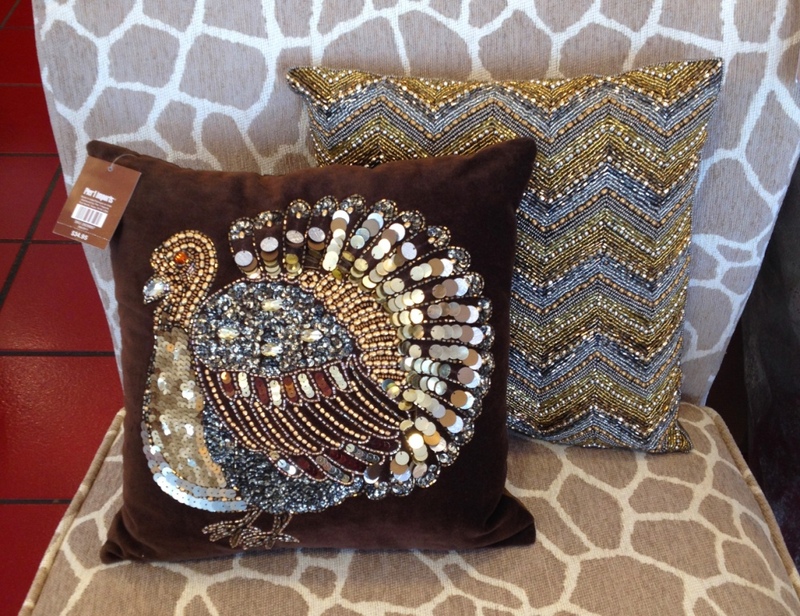 You could set this fall bird pillow out to honor him for the holiday. 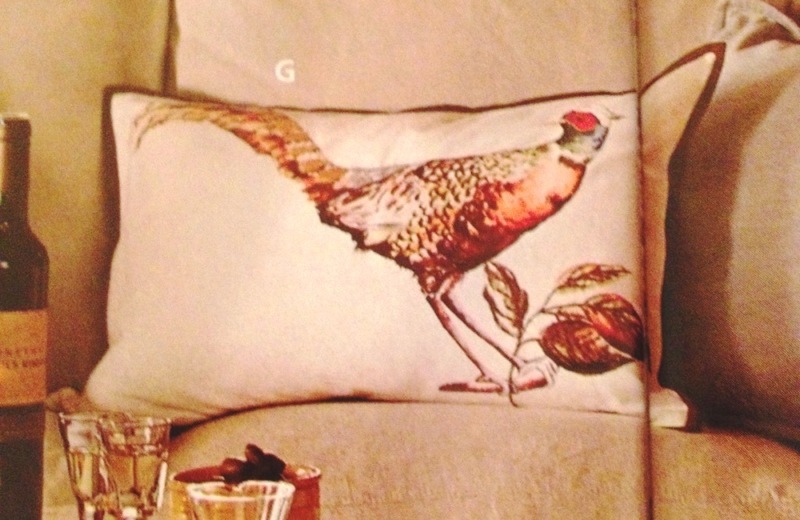 I’m kind of a bird person, so I think this pheasant pillow is lovely. I like the rich colors of fall bird feathers and the pheasant has neutrals and bold colors as well. 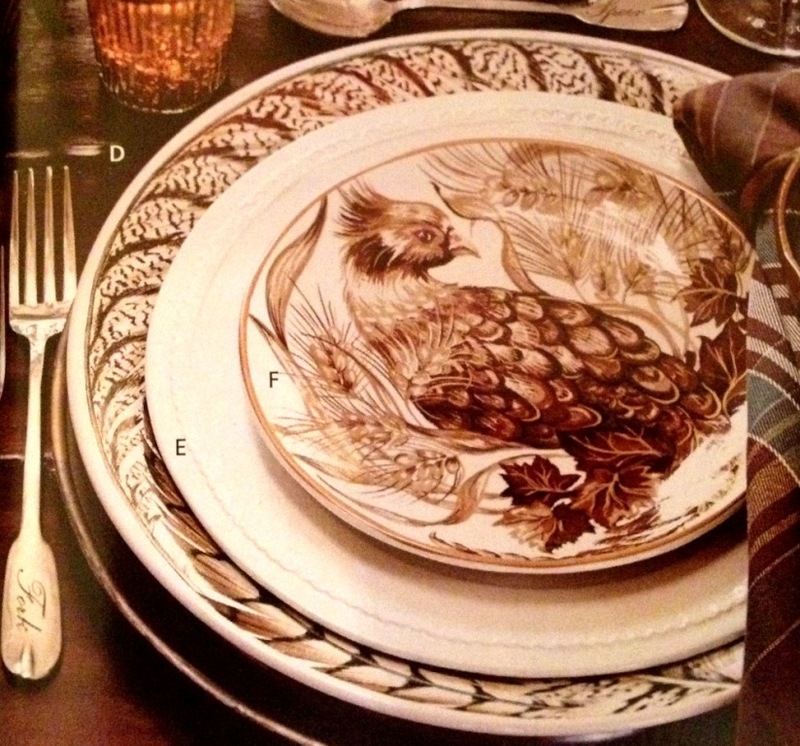 I think we ordinarily see more pheasant motifs in the fall as well since it is pheasant hunting season…aw. 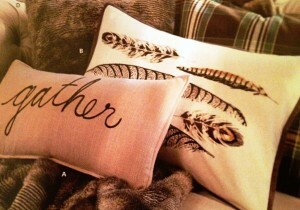 This pheasant feather patterned pillow is another nice way to get the colors without being as literal. It looks great on the sofa with the warm red pillows and how about that throw? It looks like feathers to me! 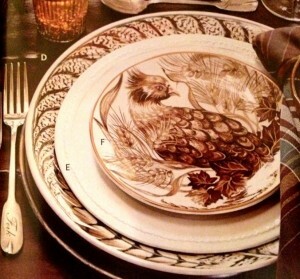 I could be wrong, but I think the fall bird depicted on this dinnerware is a grouse. This is part of why I think this whole bird thing is interesting because designers have gone further than the usual roosters and hens to include more unusual and interesting looking fowl. Yes, even peacocks are making their way into the fall bird motifs for home décor. 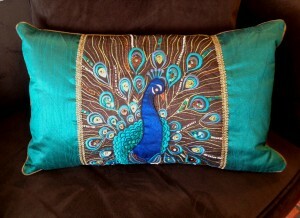 I think this is because their blue and teal colorations work well with the new blues in home furnishings. 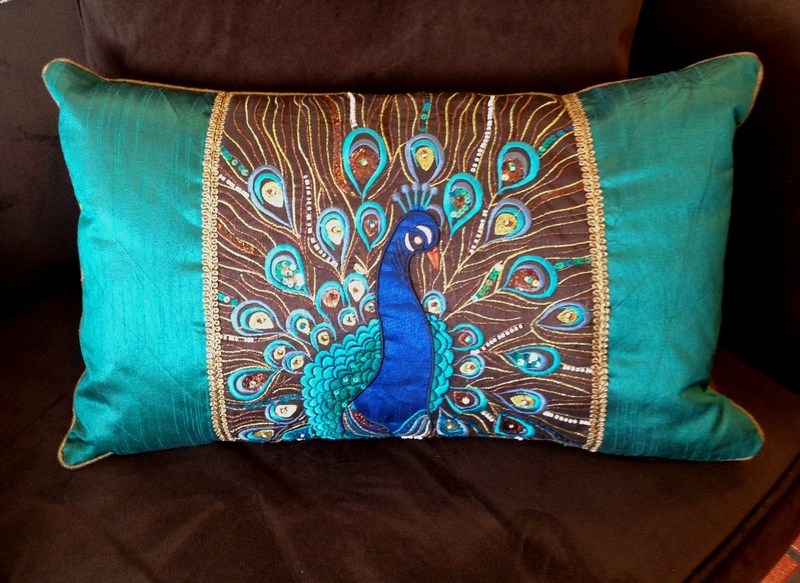 This peacock pillow really exploits the bright blue and teal and it is a striking combination – made by nature! I found both of the peacock pillows at my local Pier 1 Imports store. And, when the snow starts to fly, who do you think will come along to fill in for the bird motifs? The penguin of course! I’ll bet there will be penguin tree ornaments this year with little red skis and snowflakes – what a cute theme! If you do prefer not to show off a particular bird, you can simply display feathers! 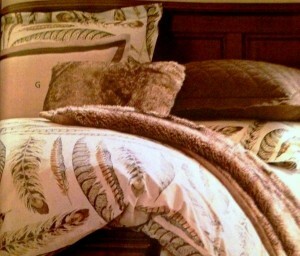 This feather designed comforter set is very detailed in design but calm and serene in the neutral color palette. 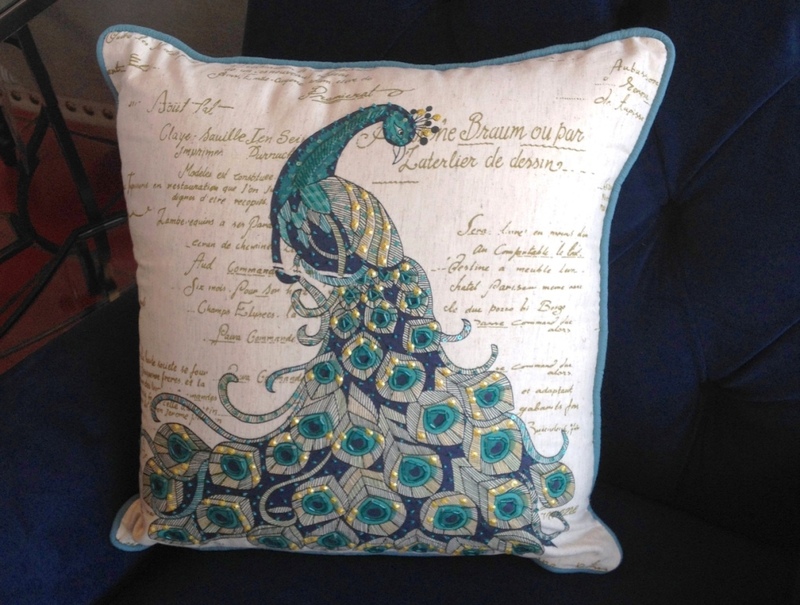 I believe this is a co-coordinating accessory pillow to the bedding above, but it could easier be an accent pillow on an office chair or loveseat. And, the feathers are a touch less seasonal than the actual birds in my opinion. 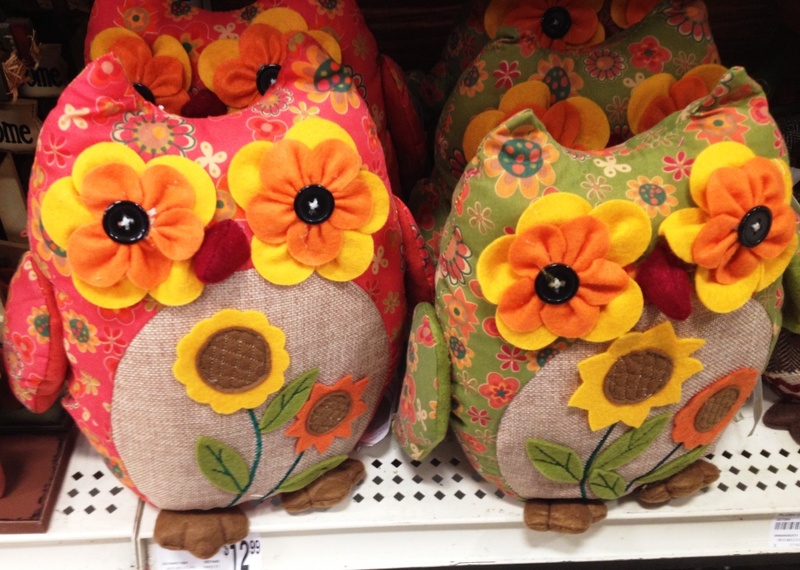 If you are looking this fall for something to give your rooms a trendsetting look, grab a couple of pillows, a comforter or salt and pepper shakers that bring the outdoors in with beautiful fall birds. Thanks for your comment. I have to agree and I fear I’m going to ditch my roosters for owls if this keeps up! I purchased that little owl pillow last year and was so excited to bring it out again this year. He sits on a chair int he living room from Labor Day until the day after Thanksgiving and adds just enough sparkle to my mustard, taupe and gray living room. 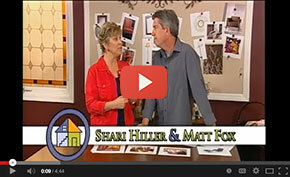 Love your site, as always, Shari. So thrilled to hear about your owl pillow!!! They are adorable aren’t they? I have so many rooster decorations I’m not sure an owl would be appropriate, so I’ll enjoy the owls in stores and through people like you! !